Here at Premier Nissan of Metairie, we offer the customized auto shopping experience that you both crave and deserve. If you're looking for innovative new cars for sale that ensure you stand out from the crowd, visit our car dealership in Metairie, Louisiana, to discover the driver-assistive 2019 Nissan Kicks crossover SUV. When you purchase one of these new rides here at our car dealership, you'll get to enjoy Nissan Roadside Assistance complimentary for 36 months or 36,000 miles, whichever comes first. Features include flat-tire changes, jump starts, vehicle lockout help, emergency fuel delivery, and even trip interruption benefits, so don't hesitate to trade up to one of these Nissan SUVs here at Premier Nissan of Metairie near New Orleans, LA today! The 2019 Nissan Kicks is able to provide you with the smooth, responsive performance that you deserve, as it's equipped with an advanced engine and features a lightweight design that allows for ease of maneuverability. Fuel efficiency is protected with help from the speed-sensitive steering that cuts down on the amount of power that is required from the engine. Add to that Active Ride Control, and you've got one impressive ride! Secure a 2019 new car that provides for your peace of mind by offering an array of both active and passive safety systems, opt for a Kicks from our new and used Nissan dealership in Metairie, Louisiana. Vehicle Dynamic Control and Traction Control work to help you stay securely on the road while the Tire Pressure Monitoring System ensures your Kicks tires maintain a safe level of pressure. Should they need air, the Easy-Fill Tire Alert makes it easy to add the correct amount. To top it all off, the 2019 Kicks boasts Nissan's Advanced Air Bag system, so what are you waiting for, upgrade to a Kicks today! The zero gravity seats help drivers stay relaxed even during long road trips while the available Automatic Temperature Control is there to combat harsh summer heat or chilly winter mornings. While visiting our new and used Nissan dealership that serves the Kenner, Louisiana, area, be sure to ask about how you can add on the Intelligent Key® with Push Button Ignition as well as Remote Engine Start so that your Kicks is ready for the road when you are. Nissan Intelligent Mobility™ is a suite of features that gives drivers a helping hand when they need it. 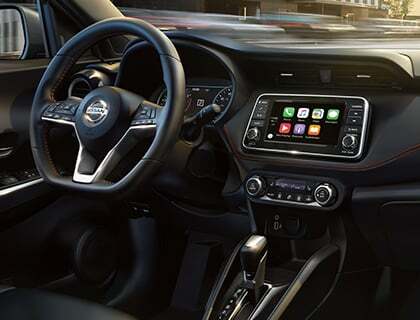 Our Nissan sales department is familiar with all the systems that you can put to use, such as Automatic Emergency Braking, Rear Cross Traffic Alert, Blind Spot Warning, and Intelligent Around View® Monitor. Contact us to learn all about the perks of Nissan Intelligent Mobility™ and how you can add these features to your 2019 Kicks. As our new and used dealership in Metairie, Louisiana, offers personalized shopping experiences, trade-in services and financing assistance, it's easy to find and secure the 2019 Nissan Kicks trim model that you deserve. Complete one of our online credit applications if you're interested in learning more about the loan options that are available to you!